I've been working a lot lately. A lot. This is a bad thing in the short term for frequent updates to my blog. But, it is a good thing in the long term as I'll be able to afford some biggish projects this summer that I will, of course, photo and blog about. In the meantime, I did do one exciting thing. Well, for me at least. I signed up for a share in a local CSA (community supported agriculture program), Harmony Valley Farm. 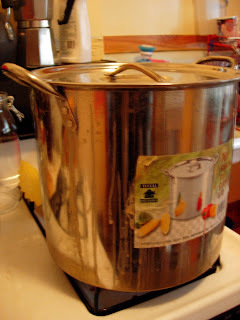 Last summer Adventures in Domesticity posted photos each week when they received their box of garden loot from Harmony Valley. It was a little sad and pathetic how excited I got just to read about which produce they received each week and what they were planning to do with it. Now, I have a fairly large 8'x15' vegetable/herb garden (for a city house) in my backyard. I can enough tomatoes to last me til the next summer....I freeze pesto that carries me to mid winter....and this coming summer my asparagus & rhubarb should finally be in their prime (knock on wood). However, there are some things I just can't grow without blood, guts and tears. I'm hoping the CSA can help me out in these areas. It should be fun. In a post last week, I wrote about the unexpected, sudden decline in the health of my swing door hardware. 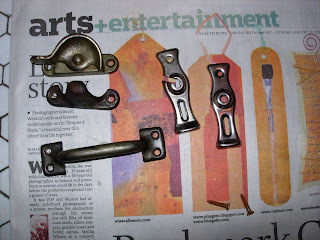 I set out this week to order replacement spring hardware for my swing door. It dawned on me that I had probably been a tiny bit Polly Anna in assuming that the new hardware would be the same size as the old hardware. So, I carefully removed the face plate of my exisiting hardware to take some measurements. Thank heavens, the old and new springs are the same size. The new face plate comes in two flat pieces and fastens at the four corners. The old face plate was in two pieces that kind of wrapped around the door's back edge with a little strip on the door's hinge edge. The plates fastened across the top & back edge. One of the problems the PO had in reinstalling the face plate, was that the holes in the door had been stripped by the screws and the screws just slid in and out. They tried to solve this problem by using obnoxiously long screws. I'd have to fill in these old holes in the door, but with the new plate they wouldn't need to support screws. The only glitch in a could-have-been-seemless replacement is the floor plate. The new floor plate works the same, but is an inch smaller in length & width. The oak side of the floor (the dining room side is oak, the kitchen side is maple) has been refinished, so I'd have to perform some cosmetic repairs with the new plate. One thing that gave me hope is that the screws used to hold down the old plate are Phillips head screws. The old house obsessed know that Phillips head screws were invented in 1936. Quite a while after StuccoHouse was built. 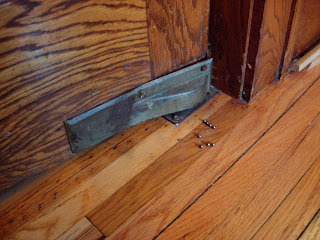 This means that the screws in the original floor plate were replaced. 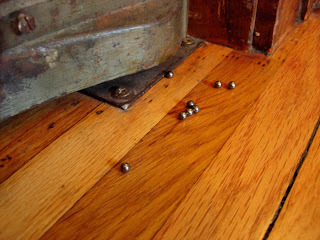 And this could have been done when the hardware was removed to refinish the floors. Meaning a shorter plate, may not be overly obvious. But here's the thing. 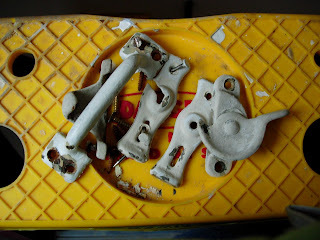 Once I removed the old face plates (and for the record, yes, I cleaned up all of the old dust you see in the photos).....collected all the remaining escaped ball bearings......the old hardware worked fine. It closes correctly and holds open at a 90 degree angle. Without 11 ball bearings (I probably vacumed one up before I realized what was happening). You know how I am about the original hardware. So, now I've back tracked. I've decided to fix the old screw holes with epoxy (note to self: buy stock in Abatron). Oil the old spring. Clean up the old face plates and reattach them with proper slotted screws. I'll add a 2008 penny behind the plate :-) As I see it, the worst that could happen is one day the door refuses to open and I once again shop for new spring hardware. I'm more than a little irritated by this whole thing. I have a two huge oak trees in my back yard. Huge. One of them has quite a few large, dead branches. If a good wind came along at just the right time, one of the larger ones could land on my roof. I've been meaning to take care of this for a while now. So, today I made an appointment with a tree guy. He was to come to my house at 4pm to give me an estimate on cutting down those dead branches. At 4pm, I was at my house waiting for him. I sat in my living room, so I didn't miss him. At 4:30 I started to wonder where he was, when all of a sudden I glanced out my front window to see him standing in my side yard chatting it up with my neighbor....then they moved to the backyard to continue their discussion. This numskull tree guy saw my backyard fence and evidently assumed that it was on the property line and the tree was in my neighbor's yard. So, he rang the bell at my neighbors to talk with him. He never even came to my house. My neighbor does not have a clue as to where the property line is. My fence is about 3 ft inside my property - otherwise it would have had to run through the tree trunk. I own about 3/4 of the said oak tree...and all of the dead branches are in my yard. My neighbor is a renter and does not have the authority to even ok work on the property he lives on...much less on mine. But, he will chat up a storm. I'm sure this tree guy thinks he got a great lead on taking care of these trees. The one thing I know for sure, is that if he cuts one single branch down now...the invoice goes next door. I hope my neighbor checked his references. This is the floor hinge to my kitchen swing door. I'm pretty sure this was not a good discovery. The hinge is not in great shape. It was removed & bent and replaced haphazardly by a PO. Probably to get the monster refrigerator into the kitchen. I have kept an eye on replacement hinges, but I had so hoped not to deal with this big, heavy door for a while. 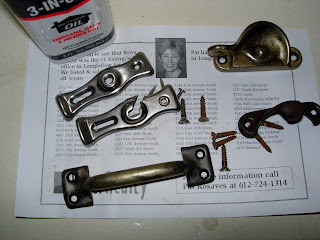 This past weekend I had a small wave of motivation that inspired me to strip the paint off the hardware from one of my upstairs double hung windows. 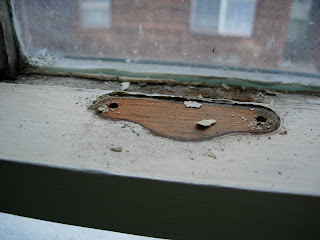 So, I decided to take some photos and add it to my little series on window restoration. Clever, huh? The process needs little explanation. I remove the hardware. 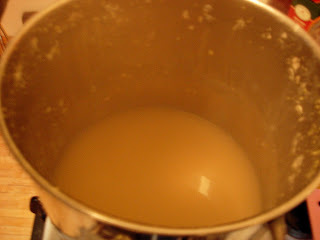 I boil it for 30 minutes or so in a water/baking soda mix in my $5.99 pot purchased from Cub Foods. The paint falls off. I polish with fine steel wool & treat with oil. I've posted about this before, but this time I have some in-progress photos. 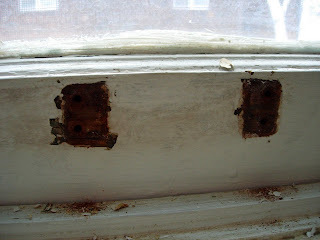 The hardware on this window is in tough condition...as is the window. But, I'm committed to using the original hardware whenever possible. 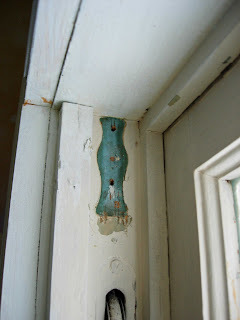 And I have found that the patina on the stripped hardware does look kind of cool against the fresh, crisp paint on a restored window.